Welcome to the Wallaceburg Bookbinding Website! 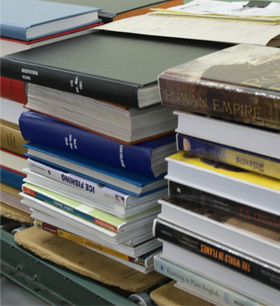 Make old books look new again with professional binding services from the Wallaceburg Bookbinding and Manufacturing Co. Our services have been increasing the lifespan and resale value of books for more than 50 years. Keep your library books in circulation for years to come. Click here for University Library, College Library, Hospital Library, school Library, Law Library, and other Library binding services. Hardcover bind your thesis with gold tamping. Click here if you are a Graduate Studies Department member or Graduate Student looking to bind a personal copy of your thesis. Rebind your used textbooks for a fraction of the replacement cost. Click here if you are a Home Educator or a School Representative. Bind your comic books or other magazine issues into hardcover volumes. We bind cookbooks, hymnbooks, journals, and more! Click here for more information.